You can say what you want about it, but I never really regretted my decision to trade my NES in for a Sega Genesis back in the day, aside from a few games that are pretty hard to find nowadays. Some of my strongest memories from that era are of those weird unlicensed cartridges Electronic Arts manufactured for Sega's 16-bit console; of those, especially the Road Rash series. 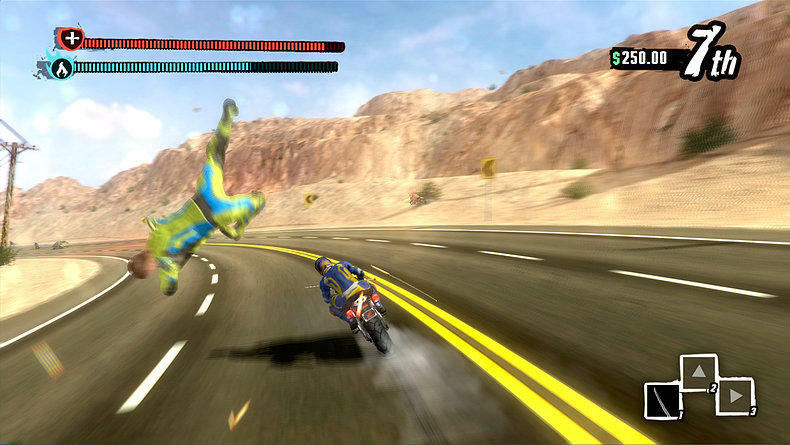 Late last week, Rock Paper Shotgun previewed Road Redemption, the spiritual successor to EA's long-dead bike brawler, allowing the game to show us just what an update to an old series like Road Rash can do. The series has never been about realism, exactly, but with the room to do some weird stuff, the team building the game is giving us the Road Rash we never knew we wanted. The core game, according to RPS, is there and running, albeit in a pretty early alpha state, but the extra mode above is what has me excited. As the cars rain down onto the desert road, what I see is something distinctly Road Rash, but with a Burnout sensibility. One of the best parts of the original series was, as frustrating as it could be at times, getting flung off your bike and seeing how far from it you were thrown. That razor-thin line between avoiding a crash and hoping you hit something is on display in this clip, and I can only hope this makes it into the final game.